Tiles line a classroom hallway in Albion's Washington Gardner High School. 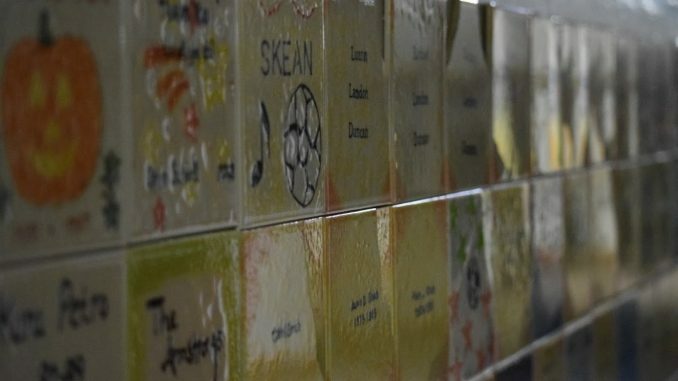 The tiles display the names or individuals or families, sometimes with pictures. The school closed in 2010. Photos and additional reporting by Peach Norman Owen. Albion’s Washington Gardner building houses Albion College’s Gracie Mack Golf Training Center, a workout room and an auditorium. Few students attending Albion College have seen Washington Gardner open for its original use: a high school. Gardner, born in 1845, was a civil war veteran, author, Albion College professor and a Methodist pastor. He served as Michigan Secretary of State from 1894 to 1899. He died on March 31, 1928. According to Passic’s “The History of Albion Michigan,” Washington Gardner High School as it looks today was built in 1928. Another school of the same name was built in the same place before then in 1872. This school was later renovated to accomodate a larger group of students but burned down in 1906. It was rebuilt again, this time to its original form, double the size of the original schoolhouse. The school closed in 2010 due to declining enrollment and Albion Community Schools’ increasing debt. Washington Gardner was then acquired by Albion College in December of 2011. Today, most of the school — save its workout room, golf center, auditorium and main hall — is closed off. Pleiad staff members received a tour of the entire building from Campus Safety Senior Associate Director Johnnie Collins. The staff’s reflections of and photos from the tour are provided. I’ve only ever been in Washington Gardner once before, so it was interesting to see the rest of the building this time. I didn’t realize how large its interior was, and there are several parts of the building you can’t get into without a key, which we were let into by Collins. It was fun to learn about the history of the building from Collins, who, along with his children, attended the school before its closure in 2010. As we walked through the halls, we found a wall of decorated tiles left up by former students, one of which Collins claimed was made by one of his children. There were a lot of empty rooms in Washington Gardner that would be nice to see utilized. Collins explained that while it would be somewhat costly to renovate these rooms, the school is already paying for heating and utilities. Some rooms look like they would make fairly nice apartments for juniors and seniors with a little work. Some of them are already semi-furnished classrooms, with chairs and couches littering the rooms. Washington Gardner captures over a century of Albion history in one building. The historic landmark still had relics from as early as the 1920’s. A gate that sits along one of the main hallways has a 1928 date stamped on the frame. The main office still holds typewriters, an old PA system and a dusty television. The history of Washington Gardner can even be seen in the stairwells. Small divots perfectly line each step from the thousands of students that made their way up and down the stairs over the years. These historic objects proved to be nostalgic for Collins. He spoke of his time as a student at the school and his positive experience learning from Albion’s best teachers. I was surprised to hear that the building once hosted elementary, middle school and high school students. Collins explained that the dynamic of so many children under one roof made it hard to keep them in line at times. As we walked on the same ground as the children and teachers before us, I began to wonder what this remarkable structure could be used for today. There is a tremendous amount of unused classrooms, offices and lounges. Converting former classrooms into new apartments for upperclassmen could bring a greater variety of housing to students. The old classrooms could also be used to host current classes, as chalkboards still line the walls. Washington Gardner, with its history and enormous amount of space, poses as a structure with unlimited possibilities for Albion College in the future. Ever since arriving on Albion College’s campus, I have wondered what all of Washington Gardner’s inside looked like. I had taken the occasional prospective student to the golf lounge located on the first floor and attended Union Board’s Big Show in the auditorium, but I had never been able to look around. Walking through the halls of Washington Gardner was like stepping back in time. While I followed Collins through the quiet, empty halls, I imagined what it was like when it was full of students moving from one class to the next. Other than the click of my camera and stories from Collins, it was silent. There are still posters, signs and even an old hula hoop left in the hallways. There is a lot of potential for the building. While Michael Dixon uses one of the former classrooms as an art studio for his community art project, there are many open classrooms that could be utilized. Could rooms be turned into small apartments for the homeless? College students? A warming center for the stray cats that live behind it? This building holds many memories for the teachers and students who “lived” and worked in it. I would love to be able to walk the halls again. See my dads old room and run up the stairs to where we used to get a pop out of the machine in the teachers lounge long before smoking wasn’t allowed. It has changed a lot in all the years but still stands as a reminder of all who walked the halls as Albion Public School’s students. Loved this old school. I went there from 7th grade till beginning of 2nd semester of 11th grade when new high school opened. Many good memories of WG. I was so afraid it was going to demolished. I am happy it was spared. These pictures don’t do it justice at all. need more. The beautiful old Auditorium, library & all the floors need more pictures of. I Attended kindergarten all the way to 8th grade in this building. Though so little picture of this big building, still brings back So many memories! It’s a shame it’s barely being used. I attended Washington Gardner from kindergarten though 8th grade as well. I even have a tile on the tile wall! Such amazing memories. Seeing these pictures brought all of those back. Thank you for sharing this. My husband has great memories of spending 32 years in Washington Gardner! It may surprise many students to know that even the Detroit Symphony came through Albion to give performances in the early 1960’s. It is truly a pity that this building isn’t being used to its full potential as a teaching space. Imagine the visual arts with the many high windows allowing so much natural light, etc.